Anna Nagar is busier than ever before as many restaurants and cafés dot the inner lanes of the locality offering all kinds of food, catering to various palates — both Indian and European. However, Dite 'N’ Bite, the newest café on the block, behind Nalli Saris, is serving the unthinkable as it makes all your favourite fast foods with a healthy addition. “A lot of people love eating junk food but are told it is not healthy and to avoid eating a lot of it. 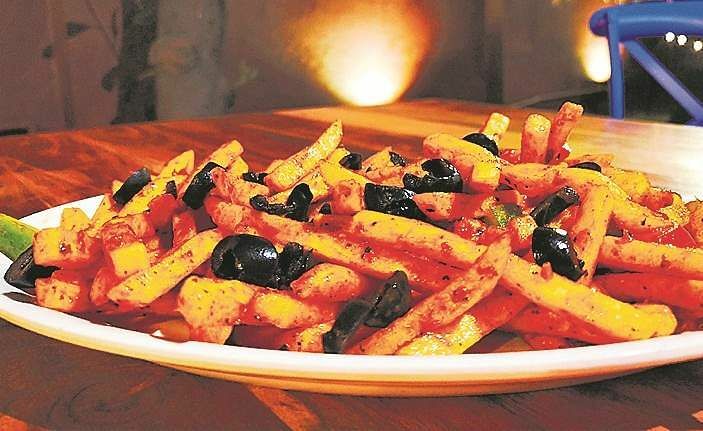 Being a junk food lover myself, I decided to give it a healthy angle which is not too hard on the body,” says 21-year-old owner K Venkata Vaishnavi. Coming from a family of food entrepreneurs, Parrys-based Vaishnavi, who is currently pursuing her degree in interior design, started her first food venture at 16, and her second at 18 before finalising on this cosy all-vegetarian café. Interestingly, the café uses a combination of protein, oat fibre and apple fibre powder sourced from the family-owned SoyVita, as its three primary ingredients to make all food healthy. The powders, Vaishnavi tells us, helps in easy digestion, given that all ingredients used are quite heavy. Situated in a garden area, the café has wall’s inspired by the Hollywood animated film Ratatouille we notice, as Chef Auguste Gusteau catches our eye on one wall, with Alfredo Linguini’s love interest Chef Colette on the other. With recycling in mind, the walls also have colourful car tyres which make up the décor, which Vaishnavi tells us is to keep it simple and casual. We start with a loaded Paneer Pizza, which we can easily take more than two slices knowing that we wouldn’t feel stuffed later. Topped with locally sourced paneer, capsicum and mozzarella cheese, the Southwest sauce and mayonnaise easily feed our cravings. We wished to try the Super Cheese Melt, which is simply fries loaded with cheese on fire! But it was temporarily unavailable. So, we immediately opted for the Peri Peri Fries, which is perfect if you’re looking for a quick evening snack in the neighbourhood. The Nachos which appear on the menu under signature dishes are a good alternative to the classic fries as the crunchy Mexican snack is simply topped with a variety of sauces, and tossed with onions and capsicum. Healthy eating always includes a salad but we decided to call on our cheat card, as we order the French Break Salad bowl. A twist on the classic salad, it is fresh and served cold as a bed of capsicum, tomato, onion, lettuce and olives are topped with French fries and chicken nuggets, with six varieties of sauces. While the café currently does not have a dessert section, waffles will soon appear on the menu but diners can opt for the vegan shakes or innovative milkshakes like the Blueberry Cheesecake to end their meal. This new Chennai restaurant has a Ferrari deliver your lunch!